GALION — After only nine months in business, Galion Contemporary ArtSpace is expanding. Owner Meg Frazier has acquired a store front in the south end of the Richland Mall in Ontario, across from American Eagle Outfitters. A soft-opening date was scheduled Friday, with a formal opening planned for mid-October. Frazier is anxiously looking forward to the opportunity to reach new patrons, as well as local artisans. “The largest and most important part of our spaces is not just involving community members, but empowering other commissioned artisans to understand how they can thrive, engage and spread their skills through our spaces,” said said. The new location will be primarily managed by Jessica Flick. To prepare for this position, Flick went through a six-month entrepreneurial program, where she walked through the same business format that Frazier used as she has built her own space. “Jessica has now decided to fully take on a space, and we will be sharing our time and work between the Galion and Ontario locations,” Frazier said. 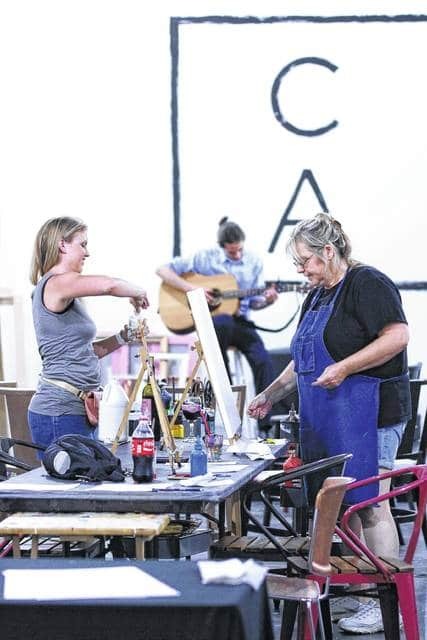 Contemporary ArtSpace at the Richland Mall will offer paint parties, art lessons, art supplies. Also, the work of local artists will be on display. At the same time, Frazier is making future plans for the Galion location and has many plans in the works. In the spirit of the Third Friday in Galion program by the Galion-Crestline Chamber of Commerce, Contemporary ArtSpace has held Third Weekend events the past few months. While the coming fall and winter months mean a temporary break for TFIG until next year, Frazier plans to keep her Third Weekend activities on schedule. Third Weekend will continue to include workshops, Family Paint, as well as Sip ‘n’ Paint opportunities. Galion Contemporary ArtSpace is also actively involved in plans for the annual Come Home to Galion festivities this coming December and the business is always available for private art lessons that can be scheduled to accommodate busy students and adults. Erin Miller | Galion Inquirer Manager Jessica Flick and a patron get ready to be creative during a recent Third Friday in Galion event at Contemporary ArtSpace in uptown Galion. https://www.galioninquirer.com/wp-content/uploads/sites/38/2017/09/web1_Contemporary-Art-Space.jpgErin Miller | Galion Inquirer Manager Jessica Flick and a patron get ready to be creative during a recent Third Friday in Galion event at Contemporary ArtSpace in uptown Galion.